In the field of long-term preservation of digital data, multimedia objects and electronic documents often a lack of adequate information is recognized regarding the state-of-the-art of what trends are already existing in the market or in the process of emerging, established approaches, standards, technologies, components, tools and solutions, which can be used effectively for this challenge. This makes it different for customers in the forefront of an implementation to develop the strategy, the requirements analysis and the roadmap, and after that during the implementation phase it complicates the project management, the bidding process and the integration of those already available experience and results into existing IT environments and processes of the customers' organization. Furthermore legal conditions or requirements are often to be fulfilled and even for those in many cases proven procedures, technological solutions and standards are existing. A way of understanding the implications of the context of a digital object is through the analysis of its lifecycle. OAIS restricts itself to the "inner walls" of the archive, which may be insufficient in terms of the additional information required to preserve the object. A broader notion of the object lifecycle is needed, so that all the knowledge necessary to reuse the objects in the future is also preserved. The lifecycle of the digital object is represented in the following figure and the different phases are described below. Creation is the initial phase during which new information comes into existence. More often than not, digital objects are not created for the purpose of archiving. The archive-able objects can be the result of complex processes that involve a multitude of stakeholders. Assembly denotes appraisal of objects relevant for archival and all processing and enrichment for compiling the complete information set to be sent into the future, meeting the presumed needs of the designated community. 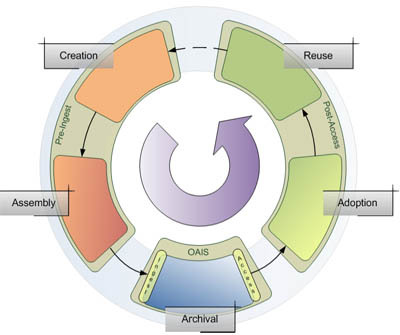 Assembly requires in-depth knowledge about the designated community in order to determine objects relevant for long-term preservation together with information about the object required for identification of relevant archive objects and their Reuse some time later in the future. Archival addresses the life-time of the object inside the archive. This spans also Ingest and Access. In most archives, policies prohibit irreversible deletion of content. Hence, preserving is a perpetual activity. The Archival phase is open-ended unless digital objects are thoroughly removed from the archive. As a matter of principal, information disseminated by the archive must enable the designated community to use that information. Adoption encompasses all processes by which information provided by the Archive is screened, examined, adapted, and integrated for Reuse. However, archives cannot accommodate all possible consumer scenarios and requirements of the designated community for Reuse. Consumers themselves have to make efforts in order to accommodate digital objects and accompanying information in their respective environment for effective exploitation within regular operational infrastructure and working processes. Altogether, the Adoption phase might be regarded as a meditation phase, comprising transformations, aggregations, contextualization, and other processing required re-purposing of the data. Also additional information beyond the information provided by the holding archive could be drawn on. Reuse means the exploitation of information in the interests of the consumer. In particular, these may comprise purposes other than that which the digital object was originally created for. Reuse of digital objects can lead to the Creation of other, novel digital objects. Reuse may also add or update metadata about the base digital object held in the archive. When ever the generation of objects is very expensive regardless if depending on engineering time, experiment or mission cost, the investment in Long-term Preservation helps to keep objects with a long-lasting life cycles for re-use alive even if hardware and software was already phased out or obsolete. This is much cheaper than to regenerate those data. Beside the objects themselves the process that had generated this object need to be preserved or when ever needed the archive content reformatted without loss to ensure reusability. This affects maintenance and service obligations as well as the need for compliance with legal obligations for the document or artifact retrieval. This affects al types of artifacts like multimedia, office, sensor, data base and scan formats. For each type there is a method to preserve the value of the objects. Also public archives are affected. Therefor the European Commission has manifested the Digital Agenda which prescribes to preserve the global memory of the community related to libraries, memory and science/research institutions. Industrial objects are in many cases subject of the same financial appreciation of values.